Hey everyone. 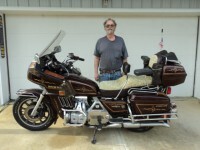 I just got my dad's 83 Goldwing GL1100 Interstate. It had been sitting in the garage for the last 13+ years covered in "junk". In the past few weeks, I have given it a bath and done some maintenance on it. The battery was bone dry and would not take a charge (obviously). I tried jumping it off with my jeep and I burned the main fuse (30A dog bone fuse) in the starter relay. I have removed all of the saddle bags, trunk and engine guards. The rear brakes were nearly locked up. Took them off. There was rust in the gas tank. I removed it yesterday and filled it up with nearly 6 gallons of vinegar. I drained the oil which was still well over 3 quarts in it. I replaced the oil filter. I removed the spark plugs and sprayed WD-40 down inside. After removing the rear brake caliper, I was able to put the bike in 5th gear and turn the wheel easily to turn the engine after the WD-40 had sat for 4-6 hours. It blew excess out of one of the spark plug holes and deposited some more in the right pipe. The pipes were rusted really bad and I have removed them all the way to the headers. Basically I am giving this thing a new life. I still have a lot of chrome to clean and polish. I also need a new battery, new tires, and some TLC. If anybody has any suggestions or tips, please feel free to comment. 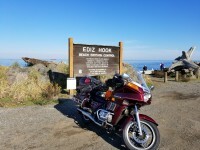 This website/forum has been a really big help when looking for answers about this bike. It has answered a lot of questions that I had concerning maintenance and replacements. Looks like she cleans up pretty good. Wow! That's the biggest set of light bars I've ever seen. Must weigh a ton. Sounds like you have a good plan. After sitting that long you should definitely replace the timing belts. If one of them breaks you will suffer valve and or piston damage. Not a good thing. Good luck! I have done several "barn finds" and three in the last few years. I paid $600 for the best one and got the last one for free. The first thing I do is get the engine squared away. If the engine is not salvageable you have a parts bike in my opinion. Depending where and how it was stored is the caveat. These older bikes are not worth the time and effort to restore unless you have a rare model, emotional attachment or you want a specific project. Most times you won't recover the money you spend to get them roadworthy. In your case I can see the attachment to your bike. Sounds like you have it well under way. Good luck and post updates! I picked up my 1100 on a trade a couple of years ago for a bike I had very little money in. Mine had not ran for quite a while but was in excellent condition body-wise. I have spent well over $2500 to get it running right, newer motor due to a hydro lock and some creature comforts. So I can confirm badandy's thoughts on the worth of flipping the bike. 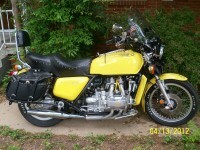 But now I have a beautiful bike with a motor that has under 2500 miles on it and runs great. Here is a list of things you probably ought to do. Always put the petcock to off when it is parked. I found out the hard way. Change all the fluids, including the brake fluid. Replace the timing belts. They are cheaper at NAPA. I have always had this done because I am timing belt challenged. Change the oil in the final drive. Remove the white electrical connections that run from the stator to the battery/solenoid. There are three yellow wires on the left (driver) side of the bike forward of the battery. The connections can, and do, burn up and damage the stator. Cut the connector off, solder the wires together and shrink wrap all three. You can consider replacing the dog bone fuse with blade type. At least get a spare dog bone. Be sure that your fan comes on when you get the bike running and it gets hot. Flush out and change the coolant. I would change the plugs after you confirm you have spark. You may want to replace the coils, but I didn't have to...yet. It has sat long enough that you will probably be getting very familiar with the carbs, cleaning them up. If you are mechanically inclined you can do it yourself. There are people here that would do that for you at a cost of labor and shipping. You would also have to buy carb kits. Cheapest route is to just buy the float bowl gaskets and spray out all of the passages and jets, with cleaner and blasts of air. The carbs will need to be synced afterwards. If your bike does start and you hear what sounds like a rod going gone it can probably traced to out of sync carburetors. Tires. 13 years is too long. Even if they look ok they are TOO OLD. Change them. Think about changing the fork oil. That too has been in there too long. Now that I've spent all of your money I wish you luck with your new Gold Wing. Running right they are the best on the road. There are great, and I mean great, how-to articles here. Probably will cover most anything you can think of. Welcome to the forum. I imagine someone will come along with a suggestion I left out. I'd make sure it runs before investing much money..belts, oil, battery maybe pull the carbs clean/rebuild at least pull and take a look at the jets ..turn her over my hand a few times, and try to start her. Use alternate fuel source hooked up to the carbs; if she starts then start on the other stuff, brakes, clutch, tires, cosmetics. Go read randakk's tech on start up after long storage. Nice project bike! 1983 is the best of the GL1100 series Goldwings. I would suggest you continue cleaning and servicing it back up to excellent condition like others here have already said. Parts are pretty easy to get for it in the United States and 80-83 Goldwings are pretty easy to work on. Find a Honda shop/service manual (reproduction or original Honda manual), it will save you from a lot of mistakes and problems. It sounds like it's been in your family for a long time so you should already know the history of the bike. Fix it, ride it and enjoy it and your Dad would be happy to know it went to a good owner and not just parted out. To clean the chrome use water and aluminum foil. Cheap and takes it off in no time. Doesn't scratch it either. Great project, I too recently aquired my father-in-law's 83 Wing (Interstate). This bike was ridden in the past year or so, and started and ran ok. It does have 200,342 miles on it though! My son and I are tearing it down to the frame to clean it and replace worn/broken parts and then putting it back together over this coming winter, can't wait to get it back together. 200,000 miles. That is incredible. I poked around for the info at the Randakk site about long-time storage but couldn't find it. Will keep doing that. I like their stuff. I love their fuel filter. Keeps the crap out of your carb and cleans out easily to keep on keeping on. Let me know if you don't have a service manual. I bought the gates timing belts (t274/t275 can't remember exact number) from rockauto. I think around 16.00 dollars each. Half of Napa. I also did the idler conversion listed in one of threads. Sorry I haven’t replied. A friend has my laptop and I really don’t like posting on my iPhone. Anyways, thanks to all for the info and advice. It will not be taken lightly. I have taken it all the way down to the frame. I have flushed the radiator. I’m going to replace the brake pads. Hadn’t thought about the brake pads. The engine inside is spotless. It was full of oil. The radiator had zero rust. It also was full of antifreeze. I was really amazed. The fuel tank had rust in it. I’ve cleaned it out with vinegar and coated it with marvel mystery oil until I can put fuel back in. I’m going to replace the rear caliper because it was frozen. Gonna look into the fork oil. Definitely changing the tires. Trying to figure out how to get to the timing belt. I’m guessing maybe taking the radiator off but I’m going to look at one of the how tos. I’ve washed all the plastics and fiberglass. I’ve got the upper fairings and the front fender polished. I’ve got the upper light bar and the spark plug covers chrome polished. Got a lot more to polish!! The air that was in the suspension was orange. I’m guessing rusty water/condensation. I don’t know if that’s okay like it is or if I can get it out. I’ll have to look into that. I replaced the fuel filter. I broke the petcock. I’m replacing the fuel lines. I’ve cleaned and degreased the entire frame. There’s a lot to do and I’m trying to do it by myself because I am the only worker and I have a wife and 4 daughters so money is tight. Btw I lost my dad to prostate cancer almost 2 years ago and I feel like the time that I didn’t get to spend with him is being made up for by spending it on this bike. I purchased some antifreeze today and I made sure to get some that was silicate free. Idk if that was what was in it prior to storage. I’ll try and post the newest pictures that I have. They will be in the member pictures area. Thanks to all who have commented. I will keep you posted. I’ve posted all the pictures that I have. Btw I yanked out the radio and the speakers. The speakers were toast and the radio??? I don’t even own a cassette tape so I’m gonna get a CD receiver with Bluetooth and new speakers for the sound. I also removed the CB radio and antenna. Idk if it works yet. I will put it back in if it does. +1 on this if it is light rust. Vinegar also works great. Welcome to the site! I’m also new to this site as well as getting dad’s 82 1100! Seems like giving it a tune up ie, spark plugs, changing all of the fluids, battery, chasing down ground problems, timing belts, checking valve clearances, balancing carbs, is a good place to start. I’ve found the “How to”section along with the “Forum” section to answer the questions that are not in the service manual. It’s super fun to ride dad’s bike and I hope that you have as much fun as I do! Got my laptop back. Now I can post pics and write comments easier. Gonna have to get a temporary part time job to finance this restoration. If I can get past the tires and the mufflers, I will be home free. Safety first! Since last post, I have waxed some more plastics (or fiberglass?) and polished some more chrome parts. I've also rearranged my garage so I can work more efficiently. Also, since the bike is on the lift, I can move it around wherever I need it. Waxing and polishing is free so that is what I'll be doing until I can get more funds. I have finished waxing all the painted surfaces and polished all of the chrome. I tried to pull out the pistons in the rear brake caliper but they will not come out. I soaked it in vinegar to see if it would break up the possible corrosion, but that did not work. I tried compressed air and it also did not work. So I sprayed WD-40 inside the caliper and closed it up and let it sit overnight. I'm going to try and get them out today. If they still do not come out, I will add brake calipers (yes, all of them since I am replacing one, I will replace all of them) to my growing list of parts. I also removed the timing belt cover to inspect it, and it does look a little rusty inside and the belts appeared to have mold/mildew growing on them. So that is ready to go when I get the replacement belts. And, since they are only $20 apiece, I will get those soon. Next steps are replacing the fuel lines so that I can reinstall the fuel tank. I don't know if I have any more pics to post, but if I do, I'll post them now. Thanks guys and gals (if any). I’ve had really good luck with blowing the pistons out with compressed air. Make sure that you place something solid like a wide putty knife on the opposite side of the pistons. They will potentially come shooting out. I’ve also heard of others hooking up a grease gun and pumping grease into the caliper and forcing the pistons out that way. Once you get them out replace the rubber, and use 600 grit sandpaper and 1200 grit sandpaper to polish the pistons up. I have tried the compressed air and they don't even budge. I used a brake piston compression tool to depress the pistons so that I could install new pads originally, and I could not get the pistons all the way in. I think they're more trouble than they are worth. i would rather buy a new or slightly used caliper than continue to work on these. I have them soaking in WD-40 so if that works, yea! If not, I'll be searching for replacements. And, I have the old pads still in the caliper to catch the pistons once they do, if they do, come out. I saw that on a video. Thanks for the info. Calipers you find will be as old as the ones you have. Find a grease fitting and use grease to push the pistons out. They will come out. I tried the grease gun, and only 1 piston came out. The other one moved, but I ended up bending my grease gun handle trying to put more pressure on it. I'm going to try a pneumatic grease gun next to see if I can use air pressure and grease to get the piston out. T274 and $12.50 each @ RockAuto. Also FRAM CH6009 Oil Filters there @ $1.41 each! !